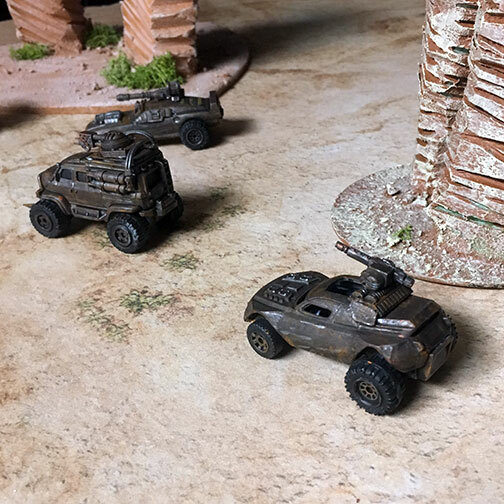 Gaslands – I've always loved Mad Max, Death Race and the like, when I was a little kid the idea of a car with guns strapped to it was just so amazing. I still remember the Christmas my grandma gave all the grandsons a vehicle from the Tonka Steel Monsters line. I had the pick-up truck "Blaster" and loved it. Many hours were spent tearing through the "desert" as Talon (the driver) was joined by my collection of GI Joes fighting it out with Badlanders in my 1980's infused imagination of a post nuclear apocalypse. I wasn't introduced to Death Race 2000 until I was "to-old" for toys and had moved on to Comics and RPGs as my money sink of choice. GURPS and the TMNT role playing game continued to feed my "after-the-bomb" imagination. Gaslands plays right into that nostalgia factor for me and has me watching Youtube for play-throughs while I convert some salvaged Hot Wheels and Matchbox cars. My ample bits box always manages to provide when I need random parts. I was a little concerned that the scale would be way off, but sucked it up and went with the cartoony, over emphasized look of my toys in the 80's. The end result has caught the eye of my kids and I have a feeling this might be the gateway game to introduce them to tabletop gaming. At the very least it's been a good introduction to the movies I used to watch (the tame edited for TV versions of course). I started the project with a car I picked up a few years ago intending to convert it for Car Wars after I picked it up for a steal on Amazon. Little did I know at the time that Car Wars needed some conversion and extra effort to play with Hot Wheels cars, not wanting to put extra effort into a side game I shelved it. Fast forward to now and the Winter Soldier car i picked up is perfect for Gaslands. A little extra armor plates and a big gun create create the car I always wanted as a kid. Having picked up a few different cars for their wheels I proceeded to put together a few different cars and ransacked our giant bin of cars for some others that will work. When making these cars for Gaslands you can try to build them to match exactly what you want to play or you can just go for the coolest look and clarify what the car has each game. I opted to go somewhere in the middle. Keeping a rough idea of how many build slots each thing I put on would take and the potential usefulness of each thing. Armor and machine guns seem to be a safe bet for most cars. For my machine guns I found the hot-shot lasguns from the Tempestus Scions work great. Trimmed down with an ammo belt added they seem to be a good scale. For the bigger truck/vans I opted for more exotic weapons like flame throwers and rockets. The ram for the front of the HumVee was made from the drills on the Assault Centurions from the Space Marine range. I did drill out the rivets to remove glass, and swap around wheels, however I'm not interested in adding screws or replacing the rivets like the pro-custom hotwheels guys do. So a dap of super glue holds it together. I also opted to glue the wheels in place (much to my kids chagrin). This helps keep the cars from rolling when painting or playing the game. It also takes the cars from a "toy" to a "model" as read on several forum posts for the game. A quick spray of gray primer hides what the cars once were and preps them for painting.